This is most interesting, because all the techno utopian hopium addicted people I read NEVER look at the big picture like this blog does. A breath of fresh air methinks…. According to the most recent data from the Global Footprint Network, humanity as a whole is currently in ecological overshoot, demanding one and a half planet’s worth of Earth’s biocapacity. As the global population continues its trend toward 11 billion people, and while the growth fetish continues to shape the global economy, the extent of overshoot is only going to increase. Samuel Alexander is Research fellow, Melbourne Sustainable Society Institute at University of Melbourne. In reality solar power’s heavily subsidized growth is nowhere close to being the revolutionary force some of its advocates claim it already is. It is also not growing exponentially, as anyone could see if they checked the meaning of the term exponential growth and actual statistics for year on year growth rates. Globally, solar grew by 93% in 2011, 60% in 2012, 39% in 2013, and 38% in 2014. Meanwhile, in the countries with the most developed solar sectors, absolute growth has in fact slowed. Germany added 7.5 and 7.6 GW of new capacity in 2011 and 2012 respectively. In 2013 and 2014 the figures had gone down to 3.3 and 1.9 GW. The same goes for Italy, where new capacity additions went from 9.3 to 0.38 GW between 2011 and 2014. In fact, the current growth of European solar is not even vaguely exponential. Instead, growth is declining overall. In 2011, 22.4 GW was added throughout Europe; in 2012 17.4 GW was added, in 2013 10.4 GW was added, and in 2014 7.2 GW was added. Absolute growth of solar capacity in Europe is now one third of what it what it was in 2011. Anyone confidently predicting continued exponential growth of solar will have a hard time accounting for the actual decline in growth in Europe. Growth of solar can be put in further perspective by comparing the annual growth (in TWh) with the total electricity consumption of a country. Let’s imagine that in a single year a country went from 0 to 1% of electricity generation being from solar panels. That would mean it would take roughly 100 years to get to 100% solar. Obvious caveat: we don’t know what to do when the sun goes down, but you get the thrust. So, how quickly is solar growing globally? 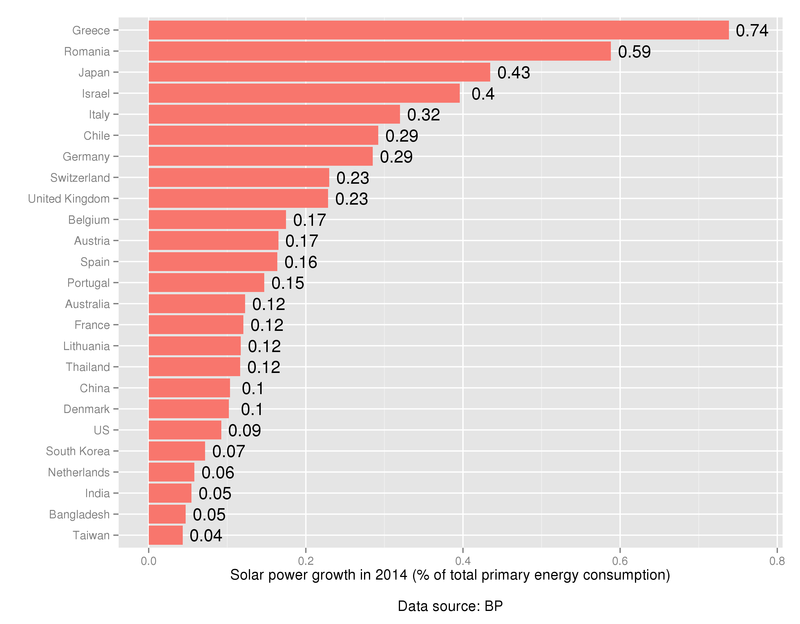 Below is a chart showing the top 25 countries in terms of solar growth last year. 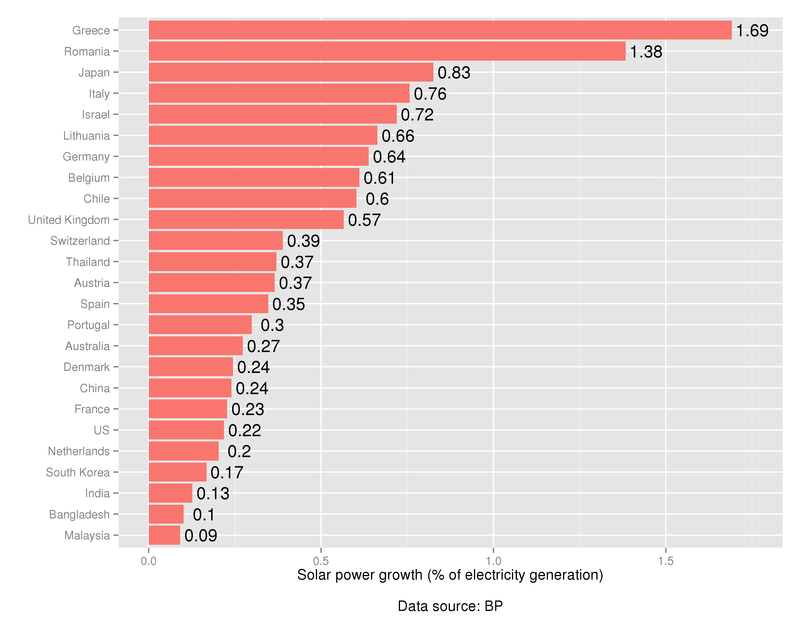 Growth is measured by comparing absolute growth of solar (in TWh) with total electricity generation (in TWh). Number 1 is Greece. Now, exactly why heavily indebted Greece is number one in the growth of a heavily subsidized source of energy generation can be debated, but the fact remains. Most importantly, no major economy is above 1%. At current rates of solar additions they are all many many decades away from solar power taking over. And remember: many of these countries, e.g. 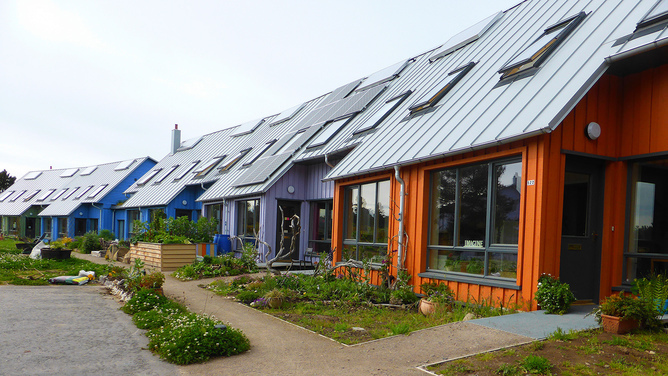 Germany, are now seeing reduced rates of absolute solar additions. Growth in solar energy in China now attracts a lot of optimistic headlines. However, the increase in solar energy last year represented only 0.2% of total electricity generation. In other words, if China kept increasing solar’s share at that rate it would take half a millennium to get to 100% solar electricity. Keep this in mind when you see misguided headlines about solar power having a major influence on Chinese air pollution. Focusing on electricity generation alone of course is problematic. The underlying reason to switch to solar power is climate change. And the majority of fossil fuels are not used for generating electricity, but for heating, flying, shipping, making steel, and so on. What we really should look at is total energy consumption. The growth of solar is much slower in terms of total primary energy consumption. Growth in solar in 2015 was less than 0.5% of total primary energy consumption in all major economies. These numbers should make it clear how far we are away from a solar revolution. The figure for China and the US is 0.1%. If China and the US added solar at a rate ten times greater than they are today, then, it would take them a century to get to 100% solar. In Germany, where a supposed solar revolution has occurred, the figure was 0.29%. 100% solar is a mere three centuries away in that high latitude, cloudy country……. where the sun still goes down. Some people talk about peak energy (or oil) supply. They expect high prices and more demand than supply. 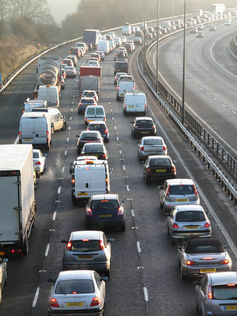 Other people talk about energy demand hitting a peak many years from now, perhaps when most of us have electric cars. Neither of these views is correct. The real situation is that we right now seem to be reaching peak energy demand through low commodity prices. I see evidence of this in the historical energy data recently updated by BP (BP Statistical Review of World Energy 2015). 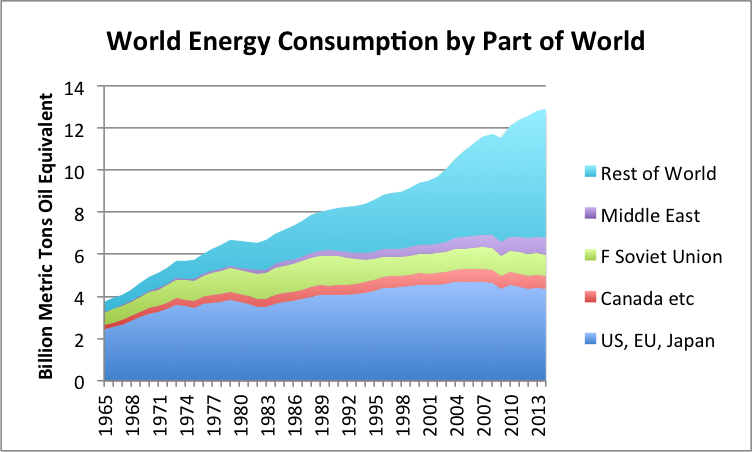 Growth in world energy consumption is clearly slowing. In fact, growth in energy consumption was only 0.9% in 2014. This is far below the 2.3% growth we would expect, based on recent past patterns. In fact, energy consumption in 2012 and 2013 also grew at lower than the expected 2.3% growth rate (2012 – 1.4%; 2013 – 1.8%). Recently, I wrote that economic growth eventually runs into limits. The symptoms we should expect are similar to the patterns we have been seeing recently (Why We Have an Oversupply of Almost Everything (Oil, labor, capital, etc.)). It seems to me that the patterns in BP’s new data are also of the kind that we would expect to be seeing, if we are hitting limits that are causing low commodity prices. One of our underlying problems is that energy costs that have risen faster than most workers’ wages since 2000. Another underlying problem has to do with globalization. Globalization provides a temporary benefit. In the last 20 years, we greatly ramped up globalization, but we are now losing the temporary benefit globalization brings. We find we again need to deal with the limits of a finite world and the constraints such a world places on growth. Many parts of the world are seeing slowing growth in energy consumption. One major example is China. 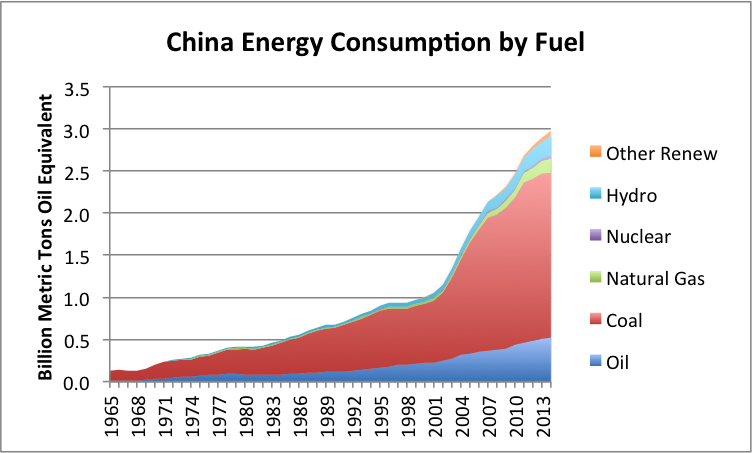 Based on recent patterns in China, we would expect fuel consumption to be increasing by about 7.5% per year. Instead, energy consumption has slowed, with growth amounting to 4.3% in 2012; 3.7% in 2013; and 2.6% in 2014. If China was recently the growth engine of the world, it is now sputtering. Part of China’s problem is that some of the would-be buyers of its products are not growing. Europe is a well-known example of an area with economic problems. Its consumption of energy products has been slumping since 2006. I have used the same scale (maximum = 3.5 billion metric tons of oil equivalent) on Figure 3 as I used on Figure 2 so that readers can easily compare the European’s Union’s energy consumption to that of China. When China was added to the World Trade Organization in December 2001, it used only about 60% as much energy as the European Union. 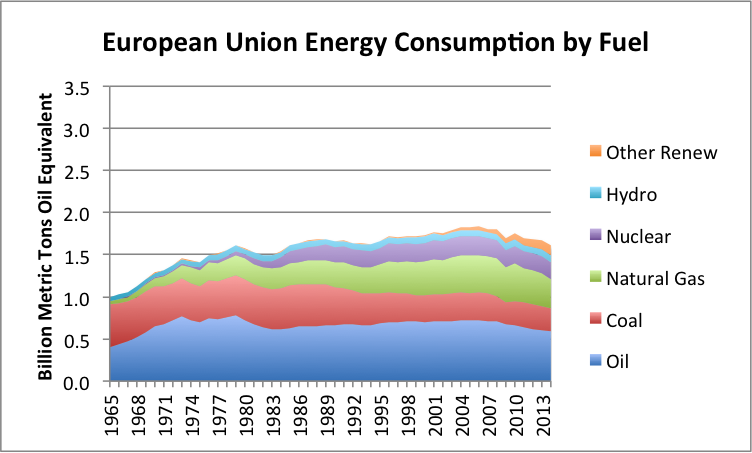 In 2014, it used close to twice as much energy (1.85 times as much) as the European Union. 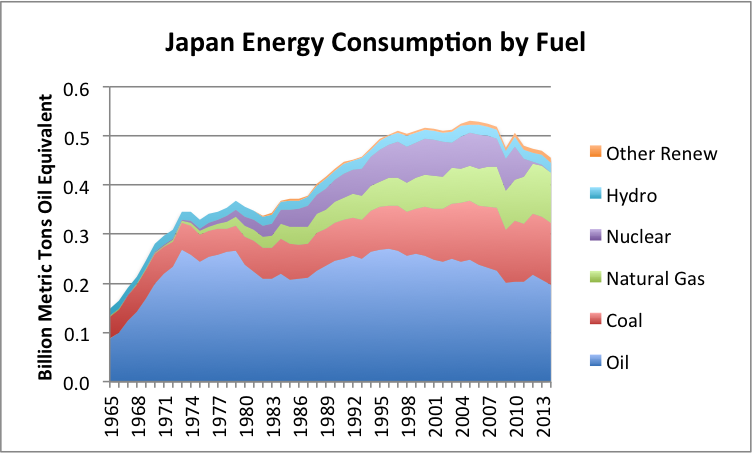 Another area with slumping energy demand is Japan. It consumption has been slumping since 2005. It was already well into a slump before its nuclear problems added to its other problems. A third area with slumping demand is the Former Soviet Union (FSU). The two major countries within tithe FSU with slumping demand are Russia and Ukraine. Of course, some of the recent slumping demand of Ukraine and Russia are intended–this is what US sanctions are about. Also, low oil prices hurt the buying power of Russia. This also contributes to its declining demand, and thus its consumption. The United States is often portrayed as the bright ray of sunshine in a world with problems. Its energy consumption is not growing very briskly either. To a significant extent, the US’s slowing energy consumption is intended–more fuel-efficient cars, more fuel efficient lighting, and better insulation. But part of this reduction in the growth in energy consumption comes from outsourcing a portion of manufacturing to countries around the world, including China. Regardless of cause, and whether the result was intentional or not, the United States’ consumption is not growing very briskly. Figure 6 shows a small uptick in the US’s energy consumption since 2012. This doesn’t do much to offset slowing growth or outright declines in many other countries around the world. 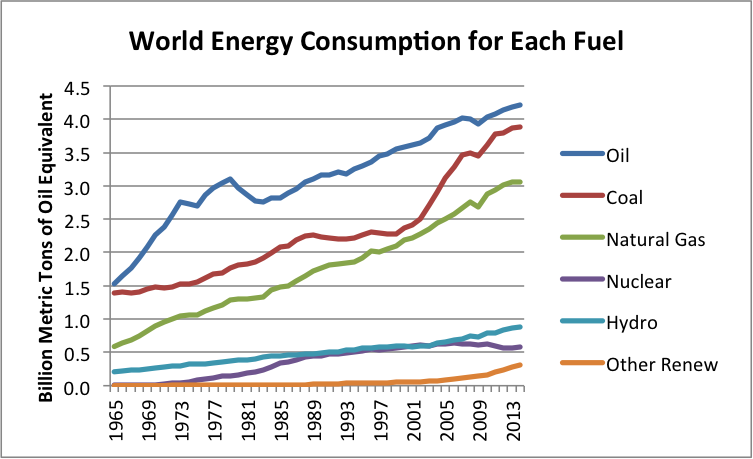 We can also look at world energy consumption by type of energy product. 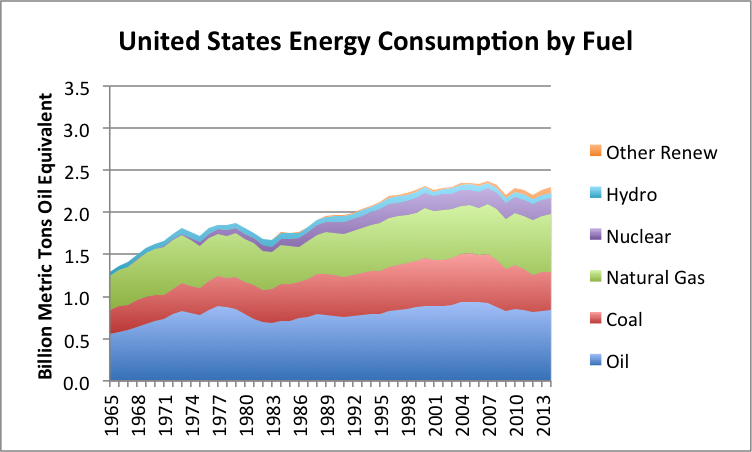 Here we find that growth in consumption slowed in 2014 for nearly all types of energy. 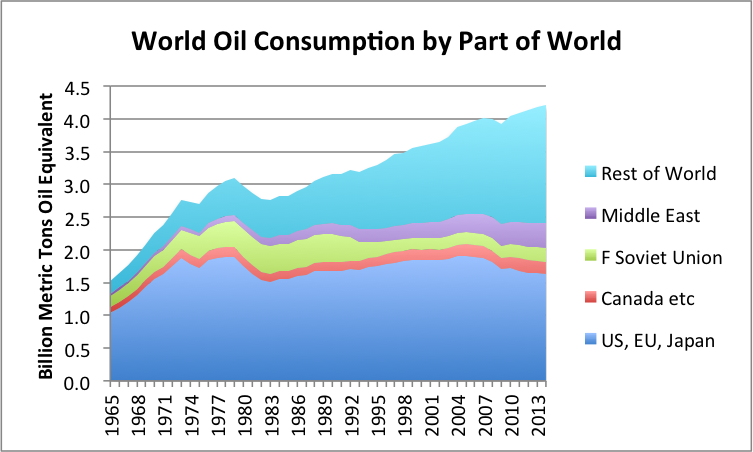 Looking at oil separately (Figure 8), the data indicates that for the world in total, oil consumption grew by 0.8% in 2014. This is lower than in the previous three years (1.1%, 1.2%, and 1.1% growth rates). If oil producers had planned for 2014 oil consumption based on the recent past growth in oil consumption growth, they would have overshot by about 1,484 million tons of oil equivalent (MTOE), or about 324,000 barrels per day. If this entire drop in oil consumption came in the second half of 2014, the overshoot would have been about 648,000 barrels per day during that period. Thus, the mismatch we are have recently been seeing between oil consumption and supply appears to be partly related to falling demand, based on BP’s data. 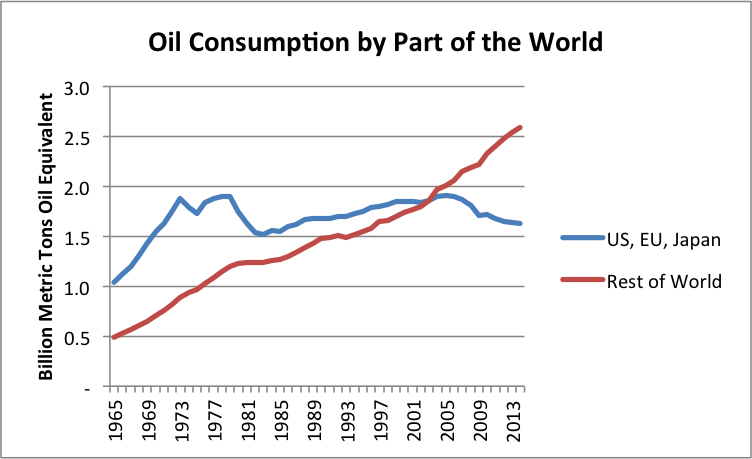 We can also look at oil consumption for the US, EU, and Japan, compared to all of the rest of the world. While the rest of the world is still increasing its growth in oil consumption, its rate of increase is falling–from 2.3% in 2012, to 1.6% in 2013, to 1.3% in 2014. 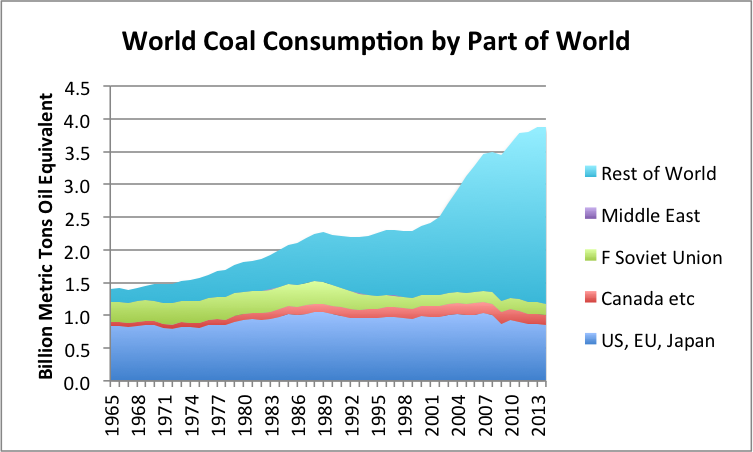 Figure 10 showing world coal consumption is truly amazing. 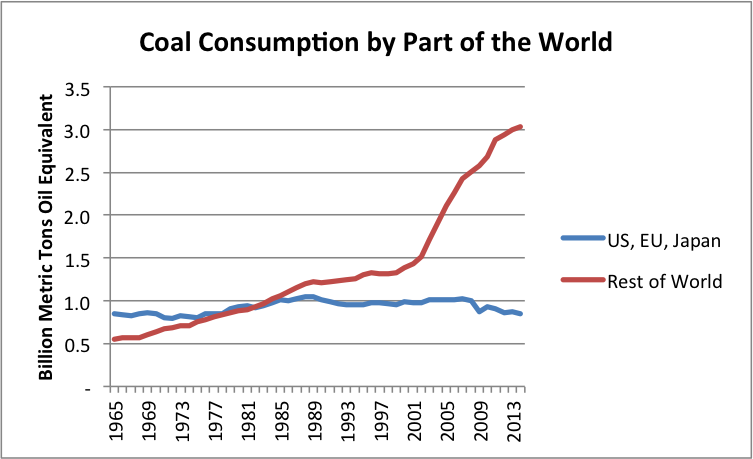 Huge growth in coal use took place as globalization spread. Carbon taxes in some countries (but not others) further tended to push manufacturing to coal-intensive manufacturing locations, such as China and India. Looking at the two parts of the world separately (Figure 11), we see that in the last three years, growth in coal consumption outside of US, EU, and Japan, has tapered down. This is similar to the result for world consumption of coal in total (Figure 10). Another way of looking at fuels is in a chart that compares consumption of the various fuels side by side (Figure 12). Consumption of oil, coal and natural gas are all moving on tracks that are in some sense parallel. In fact, coal and natural gas consumption have recently tapered more than oil consumption. 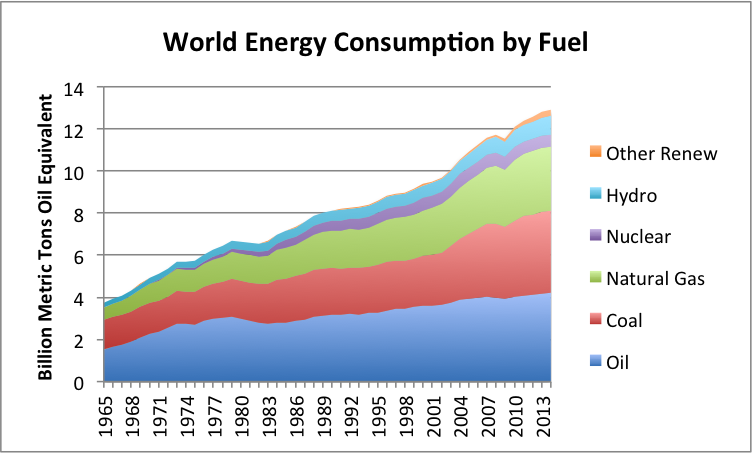 World oil consumption grew by 0.8% in 2014; coal and natural gas consumption each grew by 0.4% in 2014. The other three fuels are smaller. Hydroelectric had relatively slow growth in 2014. Its growth was only 2.0%, compared to a recent average of as much as 3.5%. Even with this slow growth, it raised hydroelectric energy consumption to 6.8% of world energy supply. Nuclear electricity grew by 1.8%. This is actually a fairly large percentage gain compared to the recent shrinkage that has been taking place. Other renewables continued to grow, but not as rapidly as in the past. The growth rate of this grouping was 12.0%, (compared to 22.4% in 2011, 18.1% in 2012, 16.5% in 2013). With the falling percentage growth rate, growth is more or less “linear”–similar amounts were added each year, rather than similar percentages. With recent growth, other renewables amounted to 2.5% of total world energy consumption in 2014. People buy goods that they want or need, with one caveat: they don’t buy what they cannot afford. To a significant extent affordability is based on wages (or income levels for governments or businesses). It can also reflect the availability of credit. We know that commodity prices of many kinds (energy, food, metals of many kinds) have been have generally been falling, on an inflation adjusted basis, for the past four years. 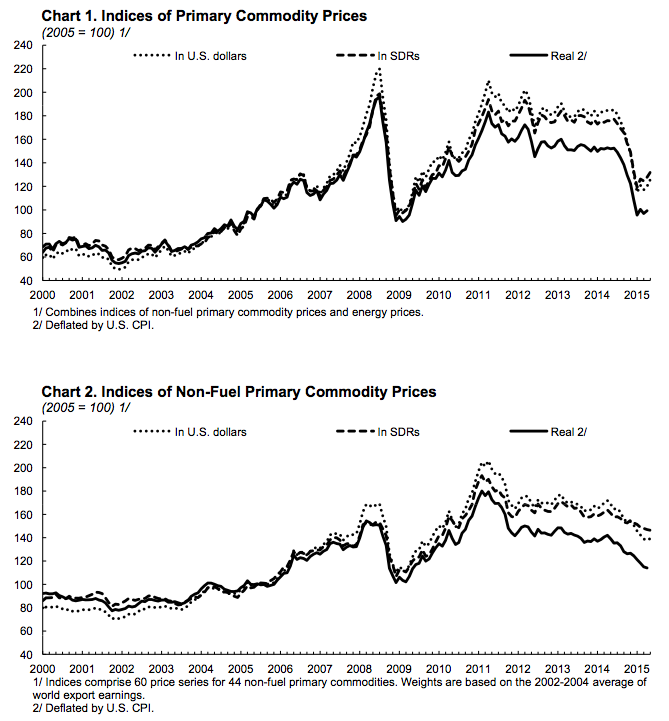 Figure 13 shows a graph prepared by the International Monetary Fund of trends in commodity prices. It stands to reason that if prices of commodities are low, while the general trend in the cost of producing these commodities is upward, there will be erosion in the amount of these products that can be purchased. (This occurs because prices are falling relative to the cost of producing the goods.) If, prior to the drop in prices, consumption of the commodity had been growing rapidly, lower prices are likely to lead to a slower rate of consumption growth. If prices drop further or stay depressed, an absolute drop in consumption may occur. It seems to me that the lower commodity prices we have been seeing over the past four years (with a recent sharper drop for oil), likely reflect an affordability problem. This affordability problem arises because for most people, wages did not rise when energy prices rose, and the prices of commodities in general rose in the early 2000s. For a while, the lack of affordability could be masked with a variety of programs: economic stimulus, increasing debt and Quantitative Easing. Eventually these programs reach their limits, and prices begin falling in inflation-adjusted terms. Now we are at a point where prices of oil, coal, natural gas, and uranium are all low in inflation-adjusted terms, discouraging further investment. Commodity Exporters–Will They Be Next to Be Hit with Lower Consumption? If the price of a commodity, say oil, is low, this is a problem for a country that exports the commodity. The big issue is likely to be tax revenue. Governments very often get a major share of their tax revenue from taxing the profits of the companies that sell the commodities, such as oil. If the price of oil, or other commodity that is exported drops, then it will be difficult for the government to collect enough tax revenue. There may be other effects as well. The company producing the commodity may cut back its production. If this happens, the exporting country is faced with another problem–laid-off workers without jobs. This adds a second need for revenue: to pay benefits to laid-off workers. Many oil exporters currently subsidize energy and food products for their citizens. If tax revenue is low, the amount of these subsidies is likely to be reduced. With lower subsidies, citizens will buy less, reducing world demand. This reduction in demand will tend to reduce world oil (or other commodity) prices. Even if subsidies are not involved, lower tax revenue will very often affect the projects an oil exporter can undertake. These projects might include building roads, schools, or hospitals. With fewer projects, world demand for oil and other commodities tends to drop. The concern I have now is that with low oil prices, and low prices of other commodities, a number of countries will have to cut back their programs, in order to balance government budgets. If this happens, the effect on the world economy could be quite large. To get an idea how large it might be, let’s look again at Figure 1, recopied below. Notice that the three “layers” in the middle are all countries whose economies are fairly closely tied to commodity exports. Arguably I could have included more countries in this category–for example, other OPEC countries could be included in this grouping. These countries are now in the “Rest of the World” category. Adding more countries to this category would make the portion of world consumption tied to countries depending on commodity exports even greater. My concern is that low commodity prices will prove to be self-perpetuating, because low commodity prices will adversely affect commodity exporters. As these countries try to fix their own problems, their own demand for commodities will drop, and this will affect world commodity prices. The total amount of commodities used by exporters is quite large. It is even larger when oil is considered by itself (see Figure 8 above). In my view, the collapse of the Soviet Union in 1991 occurred indirectly as a result of low oil prices in the late 1980s. 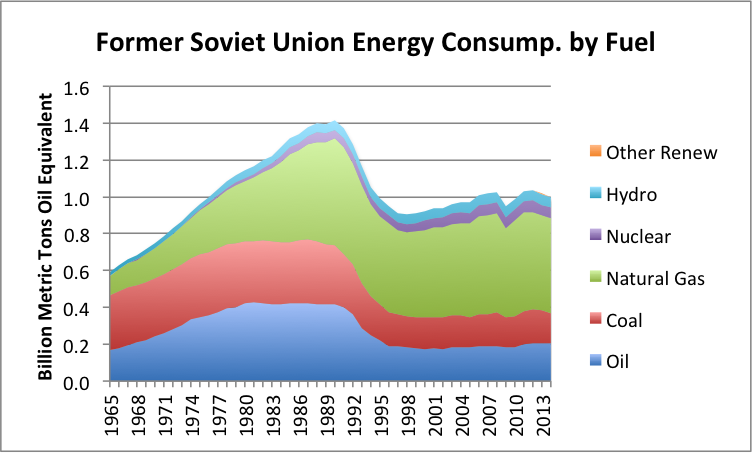 A person can see from Figure 1 how much the energy consumption of the Former Soviet Union fell after 1991. Of course, in such a situation exports may fall more than consumption, leading to a rise in oil prices. Ultimately, the issue becomes whether a world economy can adapt to falling oil supply, caused by the collapse of some oil exporters. Businesses find themselves with more factories than they need. They need to lay off workers and sell buildings. Profits are likely to fall. Loan covenants may be breached. There is little incentive to invest in new factories or stores. There are fewer jobs available, in comparison to the number of available workers. Many drop out of the labor force or become unemployed. Wages of non-elite workers tend to stagnate, reflecting the oversupply situation. The government finds it necessary to pay more benefits to the unemployed. At the same time, the government’s ability to collect taxes falls, because of the poor condition of businesses and workers. Businesses in poor financial condition and workers who have been laid off tend to default on loans. This tends to put banks into poor financial condition. The number of elderly and disabled tends to grow, even as the working population stagnates or falls, making the funding of pensions increasingly difficult. Resale prices of homes tend to drop because there are not enough buyers. Many have focused on a single problem area–for example, the requirement that interest be paid on debt–as being the problem preventing the economy from shrinking. It seems to me that this is not the only issue. The problem is much more fundamental. We live in a networked economy; a networked economy has only two directions available to it: (1) growth and (2) recession, which can lead to collapse. What we seem to be seeing is an end to the boost that globalization gave to the world economy. Thus, world economic growth is slowing, and because of this slowed economic growth, demand for energy products is slowing. 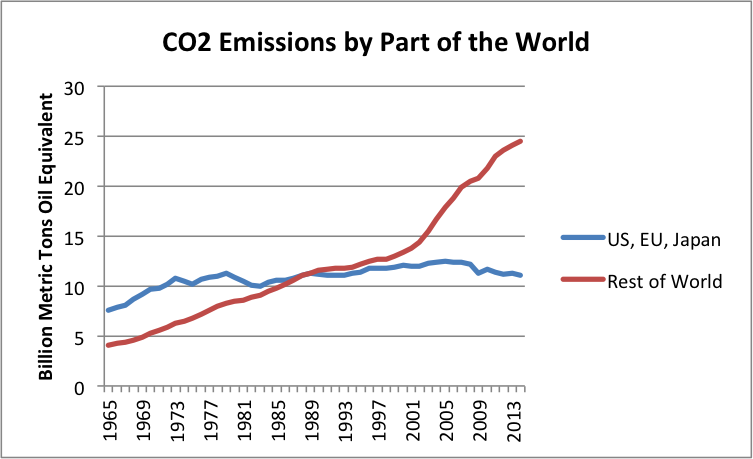 This globalization was encouraged by the Kyoto Protocol (1997). The protocol aimed to reduce carbon emissions, but because it inadvertently encouraged globalization, it tended to have the opposite effect. Adding China to the World Trade Organization in 2001 further encouraged globalization. CO2 emissions tended to grow more rapidly after those dates. Now growth in fuel use is slowing around the world. Virtually all types of fuel are affected, as are many parts of the world. The slowing growth is associated with low fuel prices, and thus slowing demand for fuel. This is what we would expect, if the world is running into affordability problems, ultimately related to fuel prices rising faster than wages. Globalization brings huge advantages, in the form of access to cheap energy products still in the ground. From the point of view of businesses, there is also the possibility of access to cheap labor and access to new markets for selling their goods. For long-industrialized countries, globalization also represents a workaround to inadequate local energy supplies. A great deal of debt is needed for the new operations. At some point, this debt starts reaching limits. Diminishing returns leads to higher cost of energy products. For example, later coal may need to come from more distant locations, adding to costs. Wages in the newly globalized area tend to rise, negating some of the initial benefit of low wages. Wages of workers in the area developed prior to globalization tend to fall because of competition with workers from parts of the world getting lower pay. Pollution becomes an increasing problem in the newly globalized part of the world. China is especially concerned about this problem. Eventually, more than enough factory space is built, and more than enough housing is built. Demand for energy products (in terms of what workers around the world can afford) cannot keep up with production, in part because wages of many workers lag thanks to competition with low-paid workers in less-advanced countries. It seems to me that we are reaching the limits of globalization now. This is why prices of commodities have fallen. With falling prices comes lower total consumption. Many economies are gradually moving into recession–this is what the low prices and falling rates of energy growth really mean. It is quite possible that at some point in the not too distant future, demand (and prices) will fall further. We then will be dealing with severe worldwide recession. In my view, low prices and low demand for commodities are what we should expect, as we reach limits of a finite world. There is widespread belief that as we reach limits, prices will rise, and energy products will become scarce. I don’t think that this combination can happen for very long in a networked economy. High energy prices tend to lead to recession, bringing down prices. Low wages and slow growth in debt also tend to bring down prices. A networked economy can work in ways that does not match our intuition; this is why many researchers fail to see understand the nature of the problem we are facing. Another post from Mark Cochrane…..
For the drought in the western US, Lake Mead is a bellwether of the situation since it is a major water source for several states and it shows such a convenient bathtub ring around its edge as the water level drops. The lake is currently more than 140 feet lower than it would be at full capacity, holding 37.1% of what it would at ‘Full Pool’. The 1075 level is more than just a psychological barrier, it is one where rationing kicks in. It doesn’t start today but in a somewhat arcane manner, if the projections for the lake’s January 1st levels are below 1075 as of mid August. What happens? Arizona takes the main hit, losing 320,000 acre-feet (AF) of water for its agricultural lands and Nevada is ‘curtailed’ by another 13,000 AF. California has senior water rights and doesn’t face ‘curtailment’ of water for its agricultural lands but the rationing will hit metropolitan areas. Since 2007, there has been a program whereby these areas could sock away water in Lake Mead using Intentionally Created Surplus (ICS) accounts. Basically by conserving water and drawing less than their maximum allowed water rights they got a credit that they could draw on at a later date. However, once the 1075 level is breached those accounts are frozen. A water-bank holiday. Not being completely clueless, metropolitan areas that saw the 1075 level looming have been making a run on their ICS accounts in the last year or more. Ultimately though, the end of ICS availability will mean that the cities will have to use less water, which likely means higher prices, quotas or similar tools to ratchet down water use further. It is possible that the lake will drop below 1060 ft this year, and highly likely this will occur next year. When this happens the last access points on Lake Mead will become inoperable – translation, no boating/tourism. In addition, power costs for energy created at the Hoover Dam will go up substantially. At 1075 feet hydropower costs will roughly double, they triple at 1050 ft, quadruple at 1025 ft, and keep rising right up until power generation ceases at around 1015 feet. Note, Hoover customers are bound by contract to have to purchase Hoover power until 2067 (link). The price of air conditioning is going up. Just over a month ago it looked like 2016 was going to definitely be a year of reckoning for all states in the US and Mexico that rely on the Colorado River for water but ‘miracle May’ could potentially forestall things by another year. The massive flooding from unprecedented soaking rains that occurred along the upper river basin are now partially replenishing Lake Powell which sits up river of Lake Mead. Lake Powell has filled by over 20 ft in the last 6 weeks and is now filling by over half a foot a day. This has only raised it to 52.5% of capacity but it could be enough to ensure that Lake Mead can be managed to be above 1075 ft come Jan 1, 2016. Extend and pretend of the water supply can probably be finagled for another year but barring a new ‘miracle’ the pain of less water and higher energy costs for the region are likely coming in the next few years. The one hope for a temporary stay of execution in the region is if the current El Nino conditions get very strong, since those conditions are often associated with wet conditions in the drought affected areas. Of course, if that happens, there will be a lot of other problems around the world where El Nino isn’t as kind. Even if this drought abates for a while, chances are that we will witness growing tensions over water use and access in the coming decades as this is the reality of the new climates that we are forcing on the planet. This article is the first in a new series, On Happiness, examining what it means and how it might be achieved in the 21st century. In a short story, Grief, Anton Chekhov tells of a wood-turner named Grigory Petrov, a drunkard and bully who for 40 years regularly beat his wife. One night he arrives home drunk and brandishing his fists. This time, instead of shrinking from him, his wife gazes at him sternly, “as saints do from their icons”, wrote Chekhov. It was her first and last act of defiance. Now driving a sled through a blizzard, Petrov is taking his dying wife to the doctor. He curses and whips the horse. He is seized by grief for a life wasted, and wonders how he will live without this woman who has sustained him for so long. I may have been a drunkard and ne’er-do-well, he mutters to himself, but that was never the true man, and now my wife is dying on me, she will never know my better nature. I beat her, it’s true, but never out of spite. 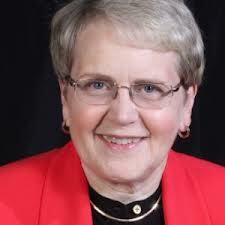 Am I not rushing her to the doctor because I feel sorry for her? In Chekhov’s story, Petrov engages in grotesque rationalisations. His dignity will not allow him to face the truth of the sort of man he is. He engages in a litany of self-deceptions, even though the truth threatens to overwhelm him. The myriad ways humans lie to themselves is a recurring theme of literature. Because we all engage in self-deception, we recognise ourselves in the characters. We are forever composing stories about ourselves and our world so as to smooth a path through life. The psychologist Shelley Taylor calls them “benign fictions”: the lies we deploy to defend our happiness. For a long time I have believed that if we deceive ourselves about our strengths and weaknesses, creating a veil that distorts our vision of the world so as to render it more agreeable, we may actually be sacrificing the opportunity to find a more authentic self from which to live. But is that chasing a phantom? Does it really matter if we find contentment by deploying benign fictions? The philosophers have always told us that happiness should be discounted if it floats on a mirage of lies. But maybe the thinkers are deceiving themselves, rationalising away their melancholy and inflating the value of their solemnity. Perhaps. Yet there is another reason to question happiness built on self-deception. It opens us up to manipulation. When we are not truthful with ourselves, we are driven by forces of which we are unconscious, but our real motives and desires can be discerned by others – advertisers, for instance. They can smell weaknesses to be exploited. So, I am willing to argue, those whose happiness rests on fabrications risk surrendering their freedom. Happiness at the price of freedom is not worth it, unless the limits to one’s freedom are freely chosen after careful reflection. But is the truth always to be preferred? The Trade Practices Act outlaws deceptive and misleading conduct by companies making claims about their products. But what if we want to believe the lies? The essence of branding is that by identifying ourselves deeply with a brand – an Apple computer, Diesel clothing, a Volvo car – we take on the image associated with it. We accept these commercially provided identities because our societies no longer offer other means of creating a sense of self that satisfies. And we are bored. Increasingly, our attention is seen as a scarce commodity. As always, anything that is scarce has a value, and some are willing to pay for it. There is even a new branch of economics called “attention economics”. When others thrust information upon us it can be regarded as a form of pollution. We sometimes try to stop this pollution harming us with devices like spam blockers, television mute buttons, “Do not call” registers and “No junk mail” stickers. However, I think many of us watch television and listen to iPods to avoid paying attention to aspects of our lives that are uncomfortable. And we want our attention to be captured because we have developed a strong aversion to boredom. It seems to me that the flight from boredom means our society as a whole is suffering from a form of Attention Deficit Hyperactivity Disorder. Movies and television programs have shorter scenes and more action to keep us “glued to the set”. Yet in order to transcend boredom it is necessary to get beneath the superficial self that is entertained by television and a thousand other distractions. Is a more authentic life possible? It is one thing to recognise that money and the consumer life are in some way shallow; it is quite another to find out what a more “authentic” life would be. Sometimes I doubt whether there can be such a thing in our secular societies. Are we destined to live out selves wholly given to us by the social conditions in which we find ourselves? Still, there must be some identity more authentic than those constructed for us by the clever manipulators who make brands and produce popular culture. At a minimum, we must fight hard against those influences, for if we do not we will end up as mere cyphers. Creating the illusion of independence is the most potent tool of the contemporary advertisers’ trade, but the irony is generally lost because most people are too busy congratulating themselves on “being their own person”. The essential ideology of modern consumerism is that we can all live freely and independently. This is an idea that emerged from the marriage of modern consumerism and the ideology of the liberation movements of the 1960s and 1970s. We now hear it expressed in inane phrases such as “be true to yourself” and “you are responsible for your own happiness”. So instead of pledging allegiance to God, nowadays a Girl Guide promises to be “true to myself”, a vapid pledge that nevertheless resonates with the inherent nihilism of individualised societies. In Australia over the past 13 or 14 years we have engaged in a national conversation about happiness and how to get it. This was in large part stimulated by the work of my former colleagues and I at the Australia Institute, building on the work of Richard Eckersley. When parents spend more time in traffic than playing with their children, is it worth it? From the early 2000s we asked whether national wellbeing was rising along with rates of economic growth. We found that the answer was “no”. We built the Genuine Progress Indicator as a substitute for GDP. We showed how advertisers were persuading us to go into debt and how they were increasingly targeting children. We pointed to an epidemic of overwork and estimated that one-third of Sydney fathers spend more time in their cars commuting than at home playing with their children. We measured the value of stuff that we buy and then throw out unused (billions of dollars worth). We discovered a deep vein of discontent, with oppressive levels of debt, marriages under stress, overwork leading to illness and depression, children being neglected and a pervasive anomie. And then we uncovered the reaction against it all by describing the remarkably large numbers who had decided to downshift – that is, to voluntarily reduce their incomes and consumption in order to take back some control over their lives. For a time we had some success, but then something happened. The 2008 global financial crisis brought to a sudden end the zeitgeist and the happiness debate that was part of it. The crash was the direct result of excessive consumption, unsustainable debt and the industries that made them possible; in other words, everything we had criticised. I always saw the happiness debate we triggered as no more than a prelude to the real task of opening people to an examination of some deeper sense of meaning in their lives, and to precipitate reflection on the moral basis and behavioural structure of our society. Yet here we are, in the embryonic stages of the next consumer boom, with no collective lessons learned from the last one.